In addition to the above mentioned RPP Garage Passes, PARK Macon-Bibb also provides an On-Street RPP Permit. Residents with this permit, may park at the following locations only without payment of the meters and may park for up to 12 hours at a time. Only 2 (two) On-Street RPP Permits are allowed per housing unit. An On-Street RPP Permit does not guarantee a parking space at those locations. 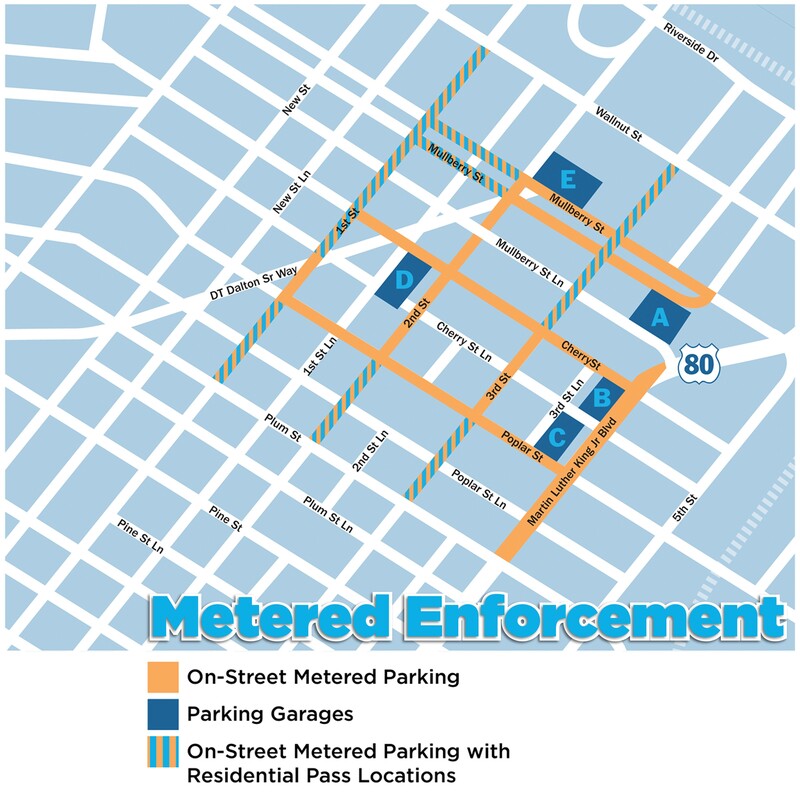 Furthermore, if there is no parking available at the above-mentioned locations, then this does not permit residents to park at other metered areas without payment. For a guaranteed parking space, we recommend the RPP Garage Pass. The On-Street RPP Permit costs $150.00 per permit. Only 2 (two) On-Street RPP Permits are allowed per housing unit. Property owners: Georgia Department of Assessment and Taxation or a current* utility bill with the owner’s name along with Government issued ID matching the name. Lessee: Copy of current signed lease along with Government issued ID matching the name. The RPP Garage Pass or RPP On-Street Permit will only be valid until the end of the lease. Month-to-month leases are not accepted. Only 2 (two) On-Street RPP Permits are allowed per housing unit. By Mail at the following address: PARK Macon-Bibb, 517B Cherry Street, Macon, GA 31201. Please mail all appropriate required documentation, the Macon-Bibb Residential Parking Program Application form and check for the amounts listed above. Do NOT mail cash.